OT Mom E-books are full of simple exercises and activities that can be done at home, with resources that you probably already have available! Pop over to my E-Book FAQ page for comprehensive answers to questions regarding payment, downloading, use of the e-books and troubleshooting. Looking for a discounted Bundle Deal? 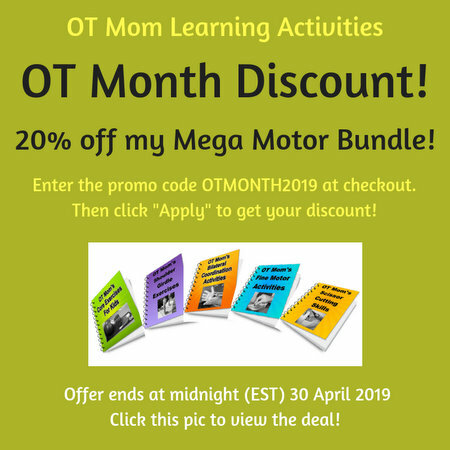 None of the OT Mom E-Books serve as a substitute for an occupational therapy evaluation and treatment. Please read my E-Book Disclaimer for further details. This 29 page e-book contains 16 pages of photographed activities, plus additional information on midline crossing and hand dominance. Included in the Gross Motor Bundle at a discounted price! This 27 page e-book contains more than 26 different shoulder girdle exercises and activities (14 pages) plus extra info and tips. A few of the exercises are also found in the core exercise book, as they work both the core and shoulder girdle muscles, which is why I offer the 2 books together in a special bundle. This 33 page e-book contains 20 pages of photographed core exercises, information on core stability, tips and guidelines. Despite containing more pages and exercises than the other 2 gross motor e-books, I have kept it the same price! Some exercises are replicated in the Shoulder Girdle e-book, which is why I offer them together at a bundle deal discount. South Africans - please check out the special payment option for ZAR! This 23 page e-book contains a scissor cutting checklist and 4 pages of photographed common bad habits that kids develop when cutting with scissors. 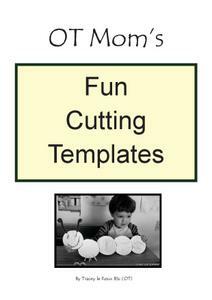 There are 6 pages packed with photographed activities that will help your child develop scissor cutting skills, plus 5 pages of bilateral coordination activities and additional fine motor ideas. This e-book is also included in some discounted bundle deals! The scissor cutting skills e-book comes with a FREE Cutting Template download that includes lines, basic shapes and cutting activities for a giraffe, boat, castle, rocket and more - valued at $1.75! This bumper 70 page e-book contains vital information on building fine motor skills, and information about pencil grasps, including a checklist to analyze your child’s pencil grasp. There are more than 26 pages of photographed fine motor activities; plus 22 pages of additional information, including a sample of shoulder girdle and core exercises, bilateral coordination exercises and more! This nativity-themed scissor activity book contains a range of Christmas cutting templates and photographed instructions. There are snipping and straight line cutting activities for beginners as well as more challenging shape-based crafts. 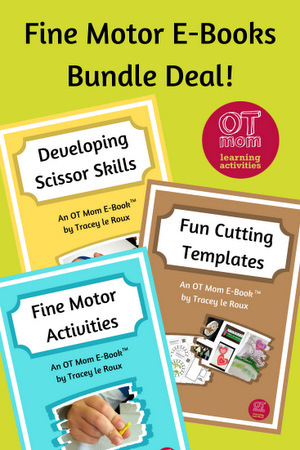 Fine Motor and Scissor Skills E-Books at a bundle price! 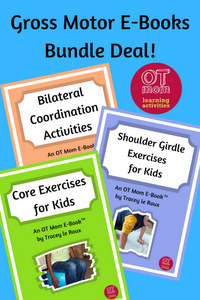 Core, Shoulder Girdle and Bilateral E-Books at a bundle price! 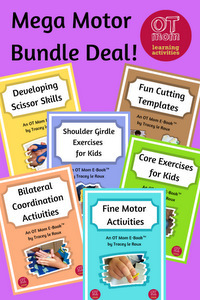 Fine Motor and Gross Motor E-Books at a bundle price! 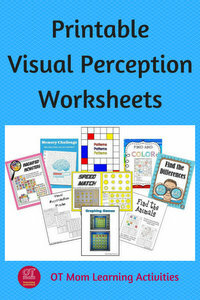 Awesome visual perceptual resources! Click on the image for an overview of inexpensive printable visual worksheets available through my site! All OT Mom E-Books Come With A Guarantee! If you're not satisfied with your e-book purchase(s), just email me within 2 weeks of your date of purchase and explain why you are not satisfied - and I'll issue your 100% refund within a week.